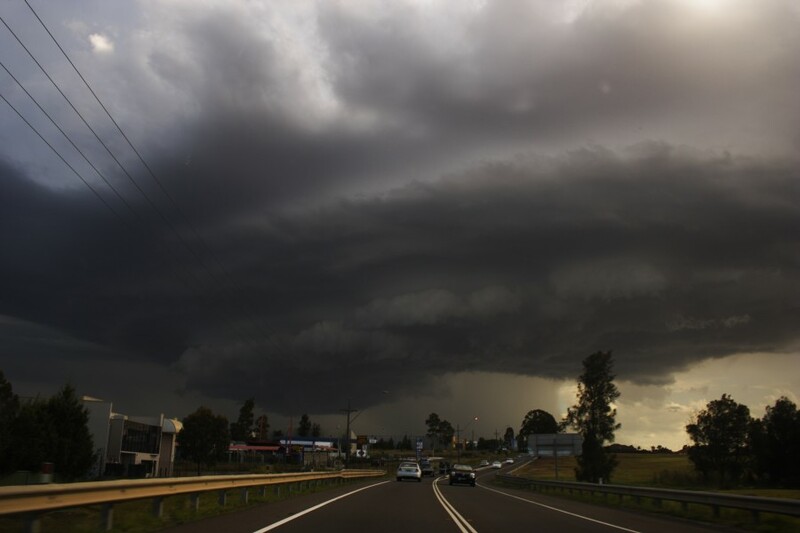 i have just got home from an awesome storm chase to the sth of Sydney. and some heavy bursts of rain. Great catch there Dave! Some really nice structure in those photos. Was it in the Sydney basin or Southern Highlands? 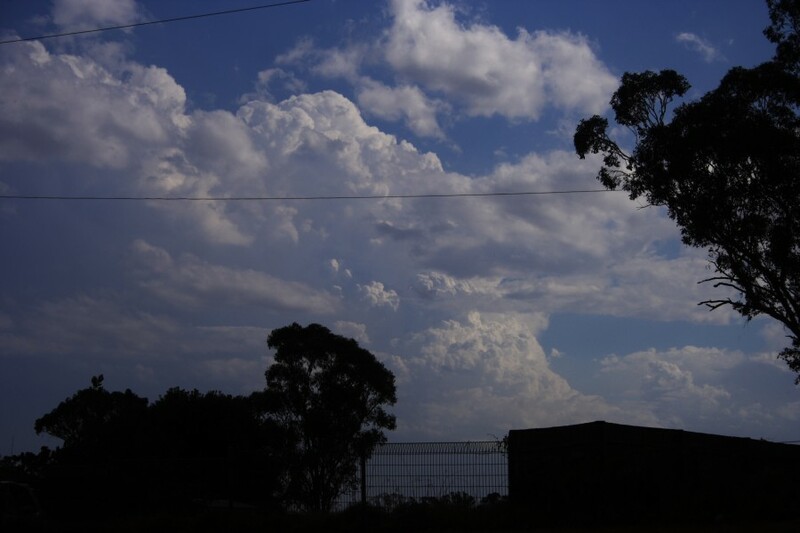 thanks, I was parked ~ 10k S of Campbelltown the cell core another maybe 5k south of me. I guess it would be the nthrn edge of the Southern Highlands. 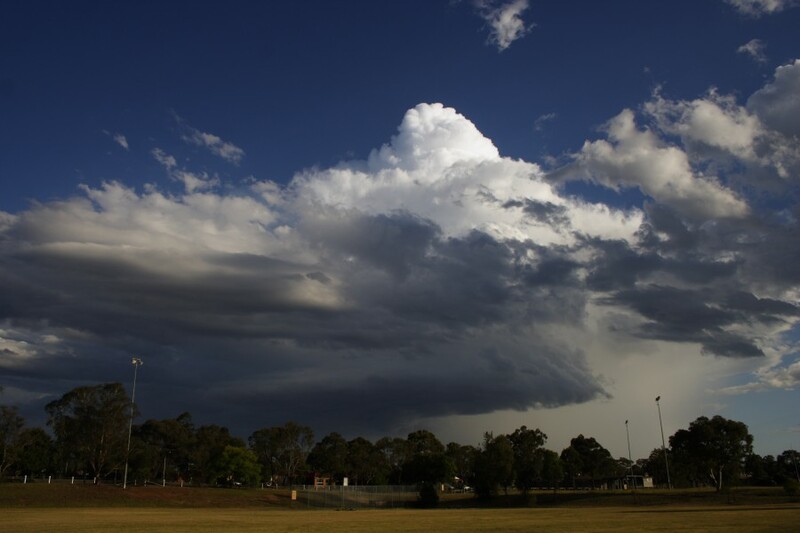 a BOM severe thunderstorm warning being broadcast over the ABC AM radio station. here's some pix of the second cell plus a funnel cloud. 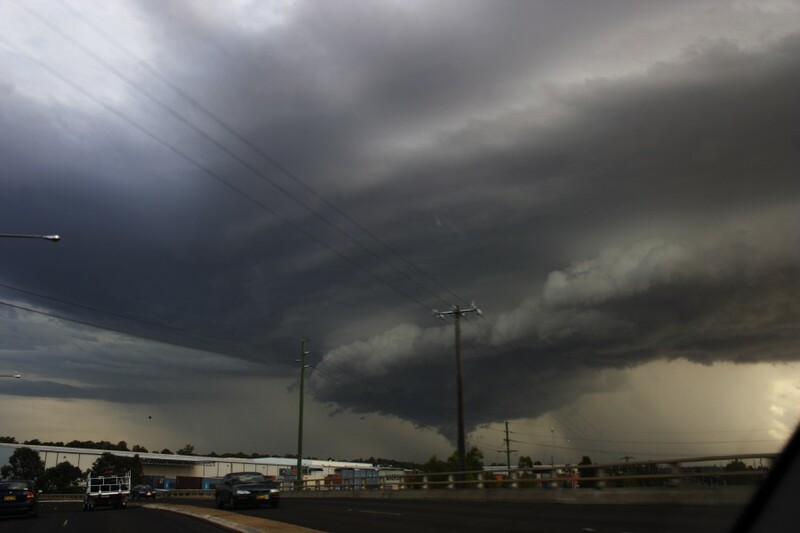 I have some photos of the southern Sydney storm I took from Auburn. 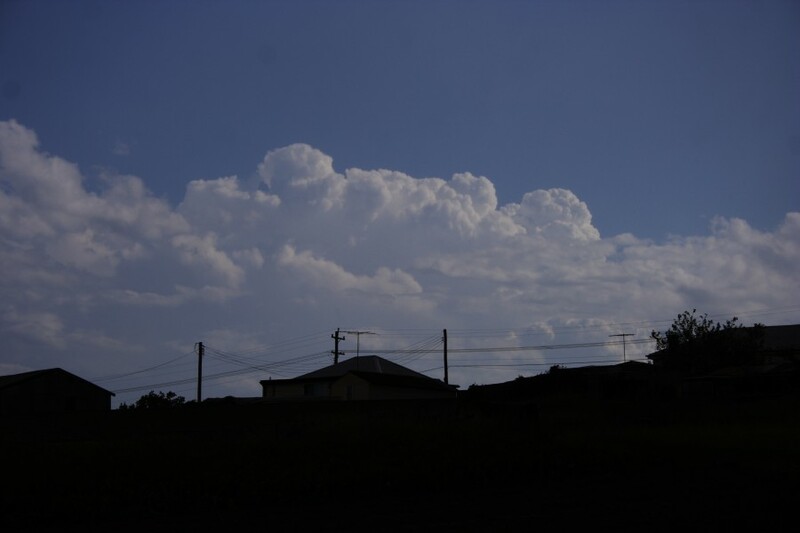 The thunderstorm was actually just to the south of the city. 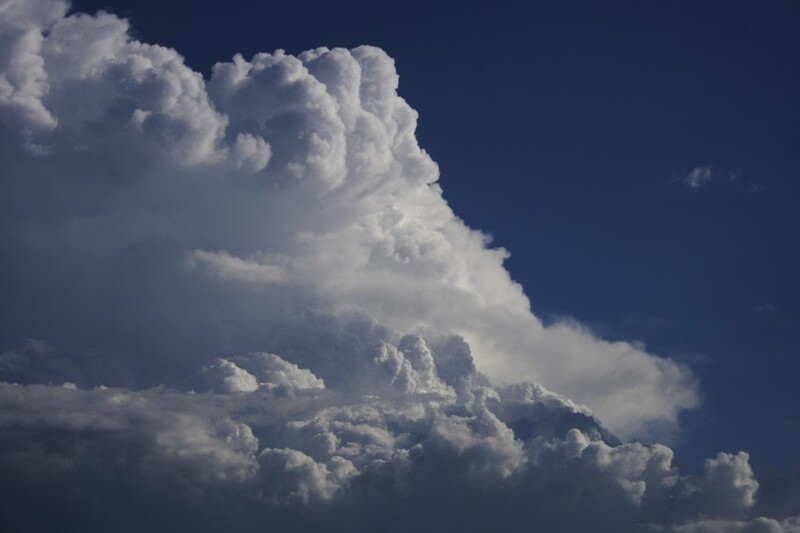 It was one of two thunderstorms that developed in the Sydney Basin late in the afternoon. 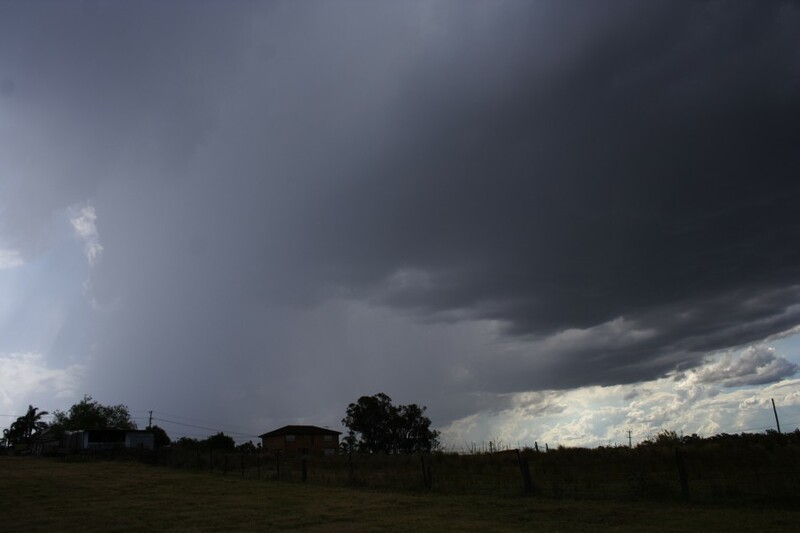 A small northern storm moved through Baulkham Hills dropping 4 mm of rain maximum at Baulkham Hills but that storm had a fairly short life, quickly becoming outflow dominant then collapsing. The southern storm was much stronger and lasted longer than the northern storm although after 6 pm that storm also started to weaken. 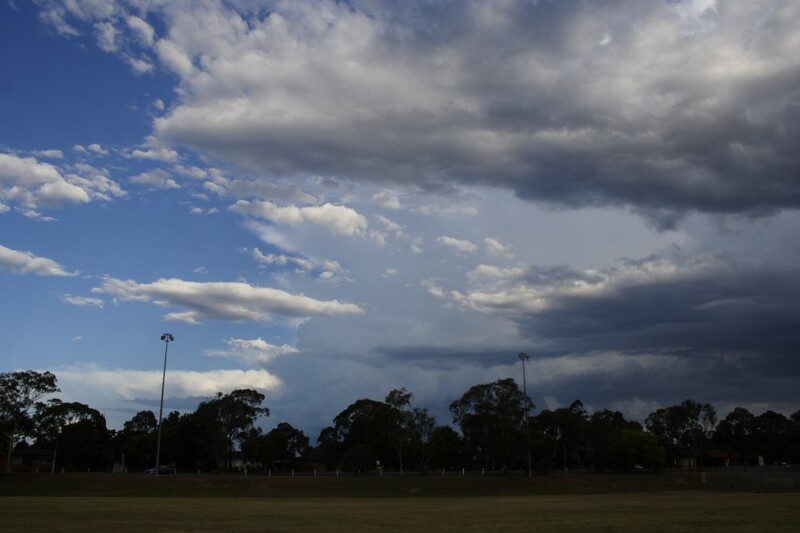 I did notice further smaller storm cells over south west Sydney following the main storm cell. 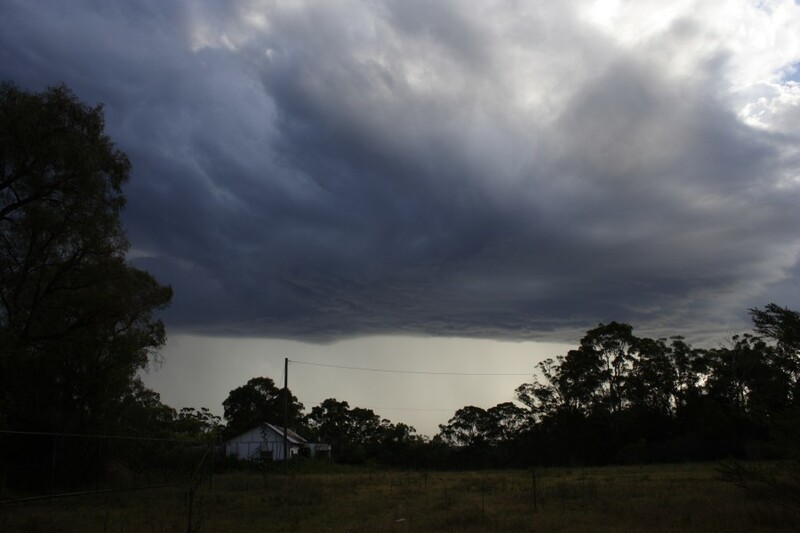 The storm dropped 30 mm of rain at a place called Reverces and 26 mm at Appin. Mostly that storm stayed just outside the Sydney built up area. The photos below have been obtained from my short video clips I took looking south. The time is from 5.20 pm to 6.20 pm at Mona Park - Off Mona Street Auburn 23/1/2009. The last photo was taken just as the cell started to weaken. 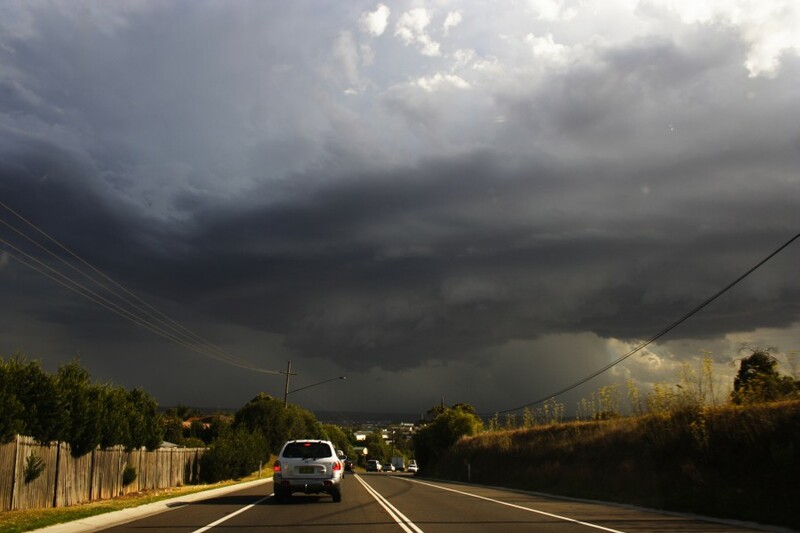 Further to my previous post 22/1/2009, I found out in the Border Mail 23/1/2009 that the suburb of Lavington experienced 20 mm of rain in 12 minutes, trees were brought down in West Albury and winds of 100 km/h occurred in the city including some outlying rural towns as well. The SES were called out to a number of jobs relating to trees being brought down and power lines damaged. What a beauty! Awesome structure and contrast. Is the inflow coming from two directions? You deserve the success of that storm chase as you were out there! I was awaiting a developing storm that dumped heavy rain on Schofields when I photographed the developing storm down south near Camden area. It did not look that impressive at that point. The curtain of rain from the Schofields storm then hid it from view for a little while. Just prior to the commencement of the rain, I decided to have a look and my eyes popped out of my head! I had not expected updrafts so crisp. Not even 5 minutes passed after the rain and I was off! Oh and my wife Imelda reminder me of the low fuel level! I know it was too late to be in position but I utilised whatever I could from the M7 to get down there as soon as I could. Then it suddenly occurred - double demerits! I needed spikes to lift my foot off the accelerator! 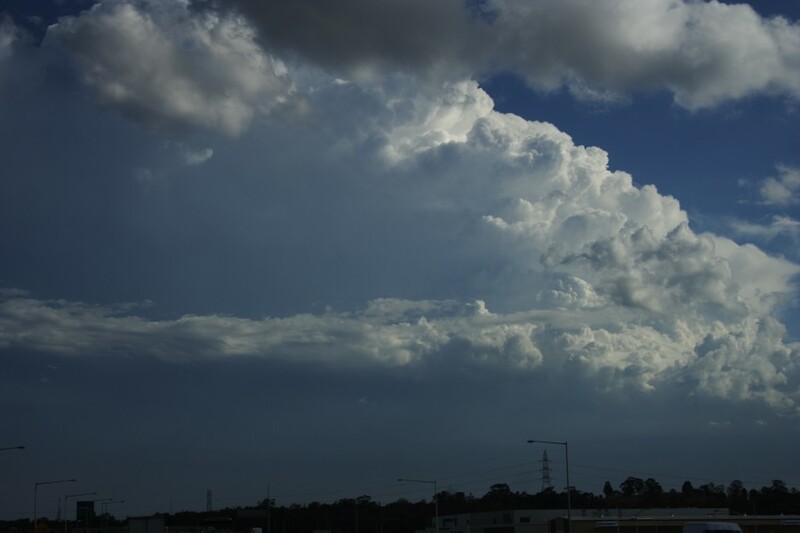 Anyway, the updrafts were rather impressive and finally the structure began to come into view as I approached the M7 toll gates near Hoxton Park. My mistake likely occurred when I took the Ingleburn exit and got entangled in regions I was simply not aware of and just to escape some of the evening M5 traffic. I got the only two decent pictures in this area and then had to fuel up and try looking for a vantage point. The other worry was the area was not likely to be inviting to a person with expensive looking camera equipment so I had to pick and choose. The storm by this time was weakening and I then positioned myself locally for the possibility of a second storm developing. It did develop but nowhere nearly as spectacular. After some timelapse I headed home. 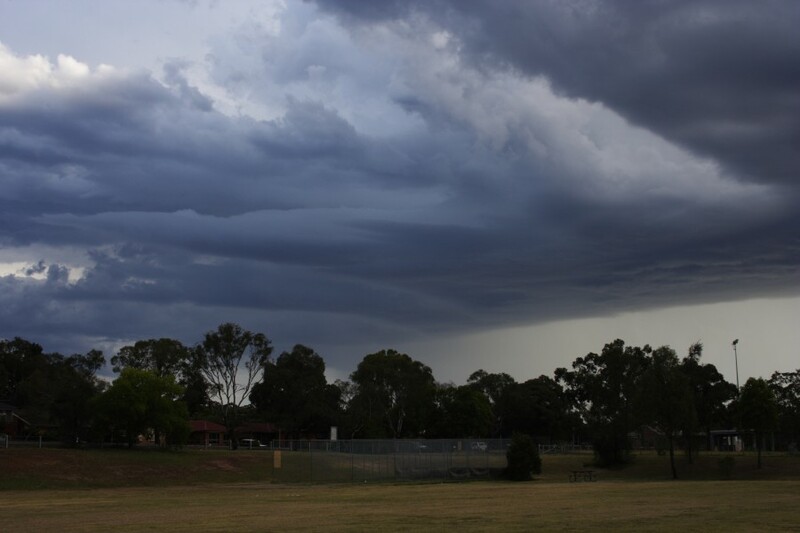 Pictures below including the first storm encroaching Schofields. The second storm in the line was not as spectacular but had a nice base. Looks like the band out West will produce today. Anyone know why the Moree radar is down? Yeah looks likely for the North Coast today into the Border Ranges. Again precipitation fell desperately short last night and was found wanting(just like Australia batting yesterday). Wow, thats a pretty unstable atmosphere for Sydney today. Dry slot at 900 is annoying and could prevent things from taking off. It's hard to imagine something wont fire up during the afternoon near the ranges and move east with the good steering wind (30-40 knots). Energy wont be a problem with high CAPE. Not sure why Aviation forecasts are going for tops to 35,000 feet. Potential for 40,000 to 45,000 tops today. Surely this is Sydney's day. If I was placing a bet for today, I would say be in the Hunter or further nth. I think I'm going to head out chasing today (which will mean it will be crap...lol). It doesn't look too shabby for up here in SEQ/NENSW. With 500mb temps as warm as they are I don't think we'll see any massive hail but with clear skies and DP's well into the low 20's, I think we could see some nice storms. Shear is lacking but might be enough to get something organised for short periods. Steering winds will push storms N or even NW. Agree that the aviation forecasts are a little off going for storm tops of 35,000ft. I think 45-50kft is more on the money. (Heading for Warwick - Tenterfield).